Vrapper is enabled from the edit menu in Eclipse. 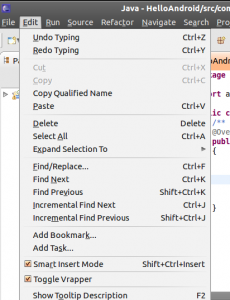 If you are new to Eclipse user but have been using vi for a long time, you may want a plugin that allows modal editing without moving your hands from the home row while not interfering with Eclipse’s auto complete functionality. The Vrapper plugin does just that. It enables vi keys to edit the source code. The Vrapper plugin can be installed from an update site. The url for the Vrapper update site is on the basics documentation page. As a newbie to Eclipse, I used a tutorial to walk through installing the plugin. 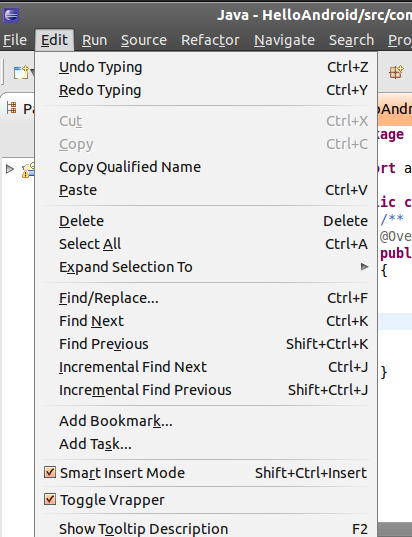 In order to use vi commands to edit code Vrapper must be enabled from the edit menu inside Eclipse. After using it for a day, I have been pleased with the plugin. It delivers what it promises. According to the Vrapper documentation, search and replace is not yet available. Other than that the only missing command I noticed was the z command to bring the text to the top of the screen. I recently watched the following video introduction to Android. I thought it was worthwhile to an Android newbie. I took some notes while I watched it. The video was a little slow in the beginning if you’ve already done the hello world tutorial. The version of Android covered was a little bit dated. I think this is the reason the video is available free on youtube. Despite being dated, the screen cast was still a good introduction. The workshop was also nice for a newbie to Eclipse. The viewer is able to see how Eclipse works by looking at the screen cast. There were a couple of technical problems during the screen cast. These were corrected quickly. The presenter demonstrated how to edit the XML files that make up an Android project. The following was specifically covered. How to edit the XML files to add color screens. How to use @+id to create auto incrementing unique identifier. How to set the gravity and background properties. How to programmatically access the XML settings by using the R (Resource) class. The presenter also covered topics unique to Android. He covered the following Android Java classes. How to create an intent. How to create an anonymous class in Java. How to use toast to pop up a text message. How to create an activity and add it to the manifest. During the presentation several useful Eclipse key combinations were shown. This video was useful to developers new to Android and Eclipse. If you are just getting started and are looking for a training video, this will be worth your time. The hello world application is a traditional milestone for many beginning programmers. I reached that milestone for the Android platform today. In order to install the development environment, I followed the installation instructions at developer.android.com. I decided to use Eclipse on my Ubuntu system. The install took awhile because several large packages had to be downloaded. I then followed the Android hello world tutorial. The first time I ran the hello world application on the emulator, I did not see the expected output. So, I ran it again and got the following warning. A google search found someone reporting a similar problem with an informative response on stackoverflow. Turns out all I needed to do was hit the back button on the emulator.